In addition to calculating displacements and stresses using the finite element analysis method, MAESTRO also performs an automatic failure evaluation of the principal structural members. Core to the modeling paradigm in MAESTRO is the ability to retain critical stiffened panel boundary conditions and parameters (e.g., true panel spans) for proper and accurate buckling assessment downstream in the analysis process. This automatic stiffened panel search capability can be performed on a MAESTRO model, imported fine mesh model, or combination of coarse mesh and embedded fine mesh. The principal structural members of the global model typically include all of the stiffened panels and their associated beams, transverse frame segments and longitudinal girders. These failure evaluation modes address yielding, buckling, and other major failure modes typically found in design criteria. For each load case that is being analyzed, the failure analysis provides a quantified evaluation of the failure modes for each principal structural member. 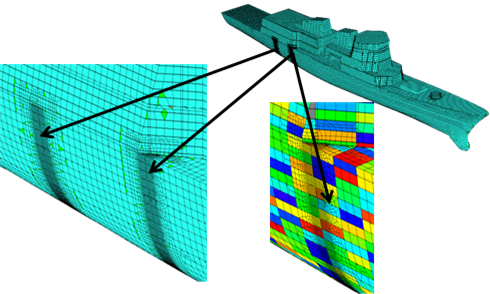 This is one of the most powerful failure evaluation capabilities available to the ship structural engineer, and results in a comprehensive level of information that identifies structural problems associated with events such as buckling. These structural failure evaluations are used by the structural engineer to assess the adequacy or degree of conservatism that is represented by the design. The available structural evaluation methodologies include MAESTRO Evaluation, ALPS/ULSAP, ALPS/HULL (hull girder ultimate strength), ABS High Speed Naval Craft (HSNC) and Offshore Buckling Guide, and US Navy NVR criteria. A structural evaluation framework in MAESTRO exists so that additional design criteria and class rule checks can be easily implemented as needed. The stiffened panel parameter and load generation capability is modularized so that it can be leveraged with multiple rule sets.